Home/Posts/How to Upgrade VMware vCenter VCSA to vSphere 6.7 Update 1? 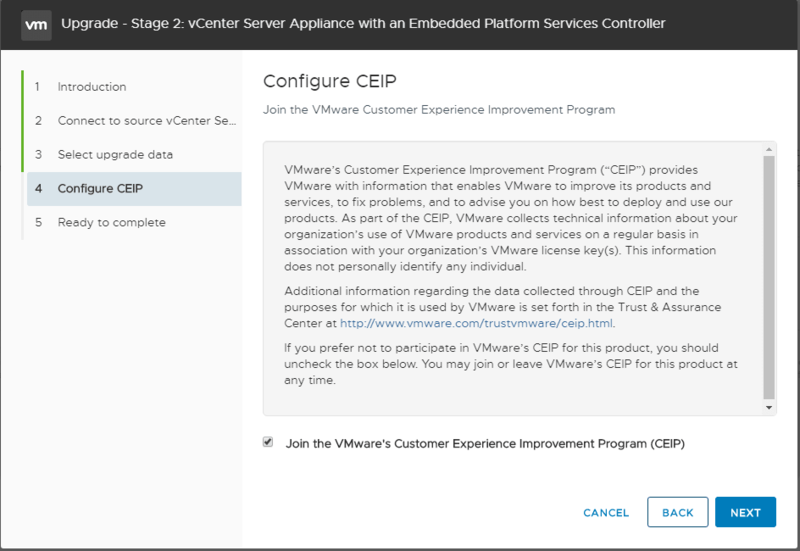 How to Upgrade VMware vCenter VCSA to vSphere 6.7 Update 1? VMware vSphere 6.7 Update 1 contains many great new features that are certainly worthy of looking at for an upgrade target. With many organizations now looking at upgrading their vSphere environments to vSphere 6.7 Update 1, there are certainly things to consider for a successful upgrade. However, in this post and the next, we will look at the actual upgrade process itself. 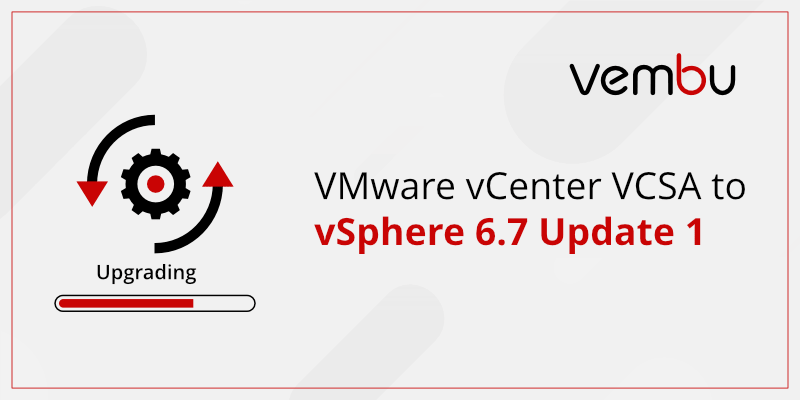 What steps are included to upgrade from a legacy version of VMware vSphere to the latest version – vSphere 6.7 Update 1? We will look at the order of operations for the process itself and how organizations can upgrade both vCenter and the ESXi hosts successfully. 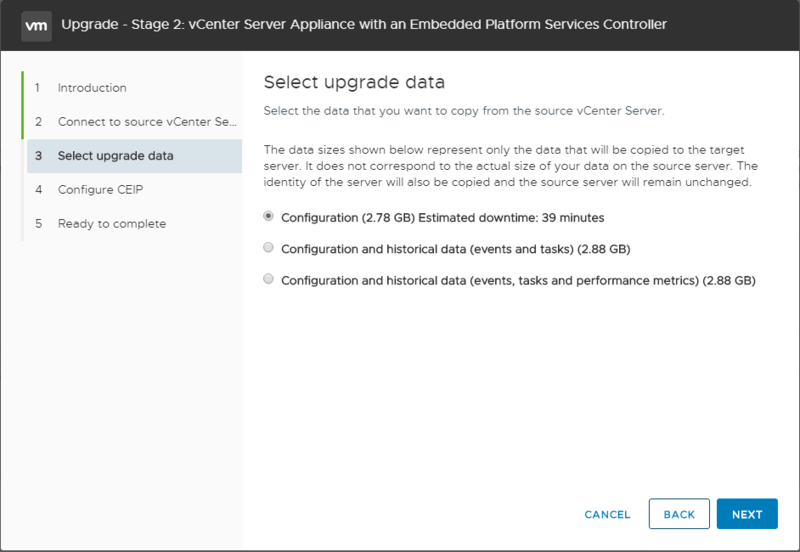 In the first part, we will key in on the vCenter Server and utilizing the upgrade installer to perform the upgrade to the latest VCSA appliance. There are certainly things to consider with an upgrade of VMware vSphere. How is an upgrade of vSphere carried out? When thinking about an upgrade vSphere environment, customers need to follow an order of operations in upgrading the vSphere environment. What is the order of operations when upgrading? Below is a quick listing of native VMware solutions and the order of upgrading to vSphere 6.7, found in the VMware KB article 53710. Be sure when upgrading your environment to take an inventory of all VMware solutions that are integrated into the vSphere environment along with all third-party solutions that are reliant upon connections to vSphere. Be sure to check with those third-party providers for their relevant compatibility and interoperability matrices. 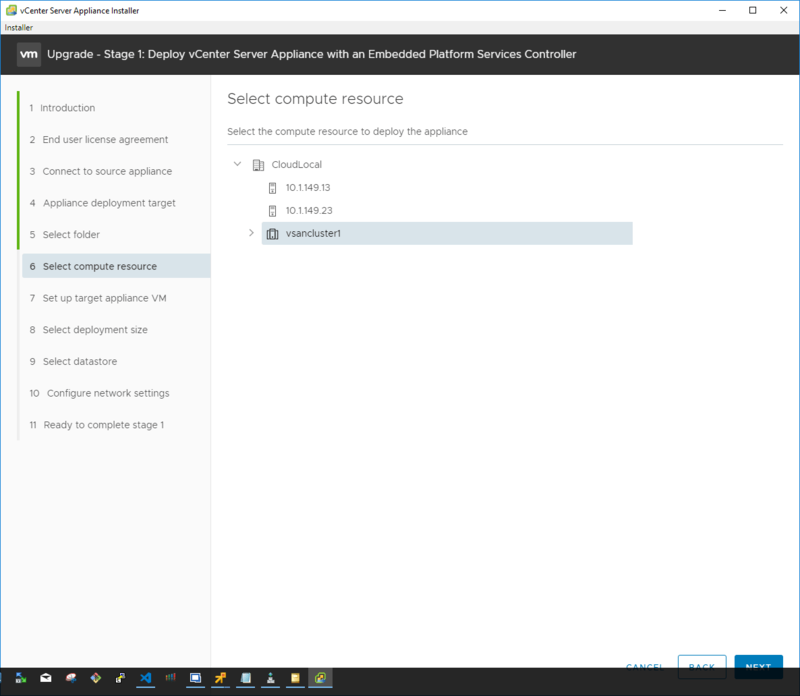 In the following walkthrough, let’s take a look at upgrading a simple vSphere environment that only consists of vCenter Server and a cluster of ESXi hosts. In the above list, we have highlighted the vCenter Server and ESXi hypervisor in the list above. As you can see, these both sit in various places in the recommended order of operations from an overall VMware products standpoint. If you have any of the other solutions, you will need to look and see where it fits in the overall order of upgrade operations set forth by VMware. 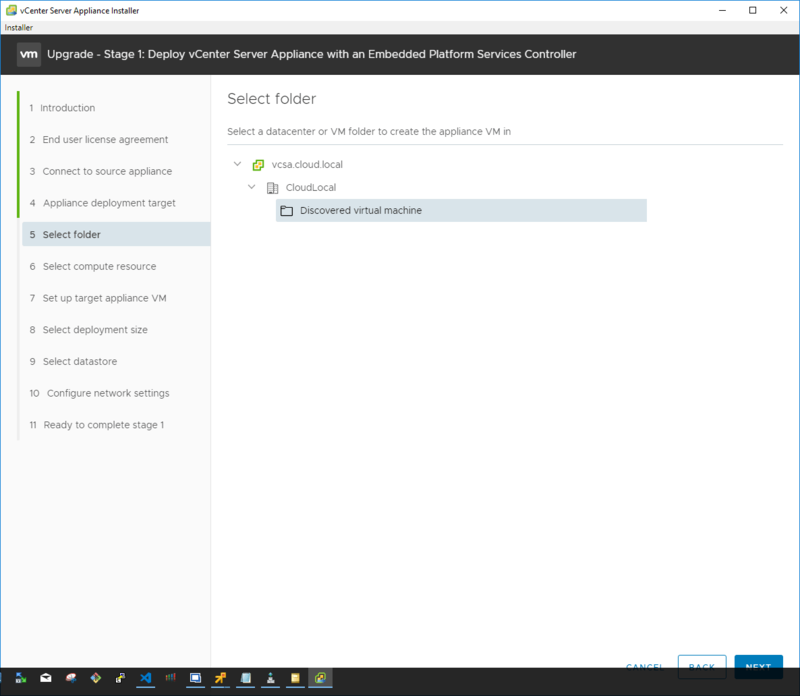 When looking at a simple configuration of only vCenter Server and the ESXi hosts in the cluster, the process to upgrade the vSphere components in that configuration involves upgrading vCenter Server first, and then upgrading the ESXi hosts. In the following walkthrough, let’s upgrade an existing vCenter 6.5 U2 VCSA installation to vCenter 6.7 Update 1 VCSA. 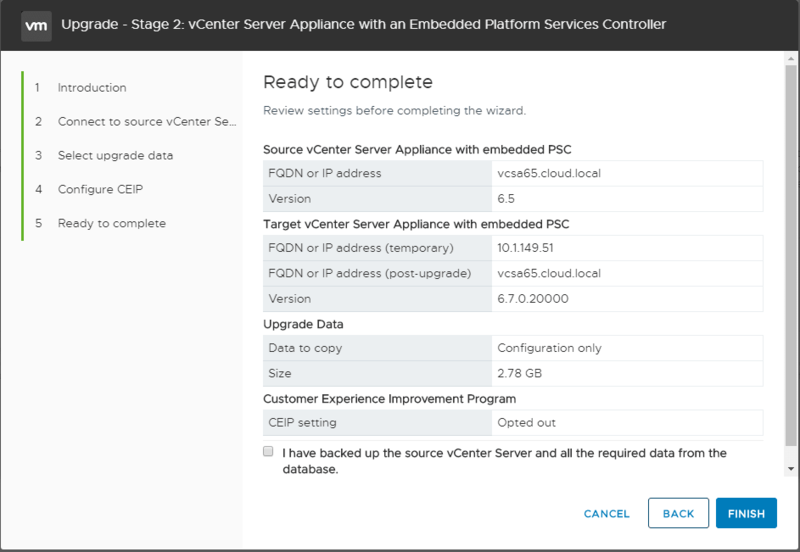 The process is the same as the one established with the VCSA 6.5 upgrade process. The ISO installer that is downloaded contains the GUI installer/upgrade utility that allows deploying, upgrading, migrating from Windows vCenter, or restoring an installation. 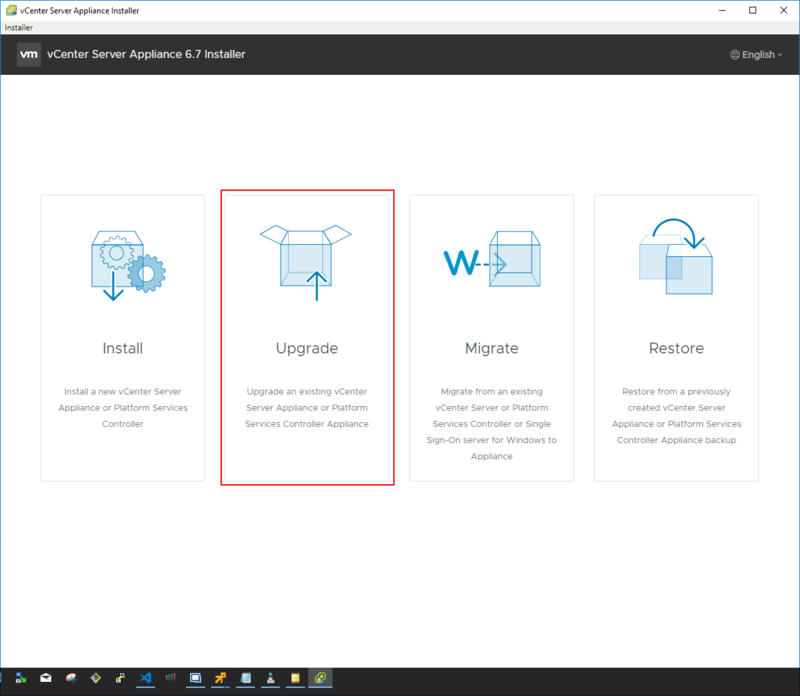 When upgrading, the process involves deploying a new vCenter Server VCSA 6.7 Update 1 appliance and then copying the configuration and data from the upgrade source VCSA appliance over to the new appliance. The new appliance then assumes the identity of the source appliance and the old VCSA appliance is powered off. After downloading the new version of vCenter, which is downloadable from VMware as an ISO file, you simply mount the ISO and run the UI installer. This launches the utility that allows you to choose the operation you want to perform. The installer will happen in 2 stages. The first stage is to deploy the appliance. The introductory screen describes the process in detail and the various steps taken in each stage. 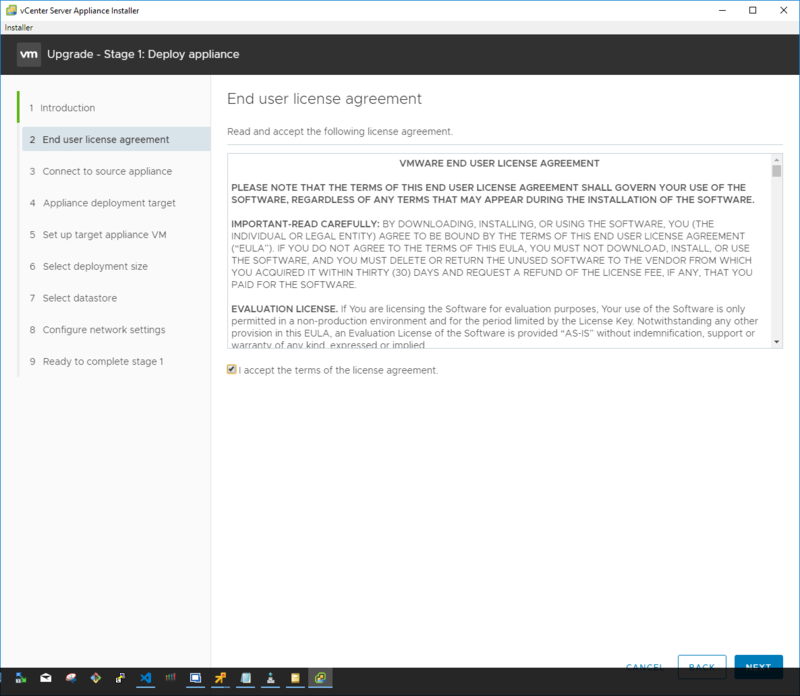 Next, accept the EULA presented for the installer. Now, we connect to the source appliance by providing the credentials for connectivity. Additionally, you connect to the source ESXi host or vCenter Server that manages the source appliance. 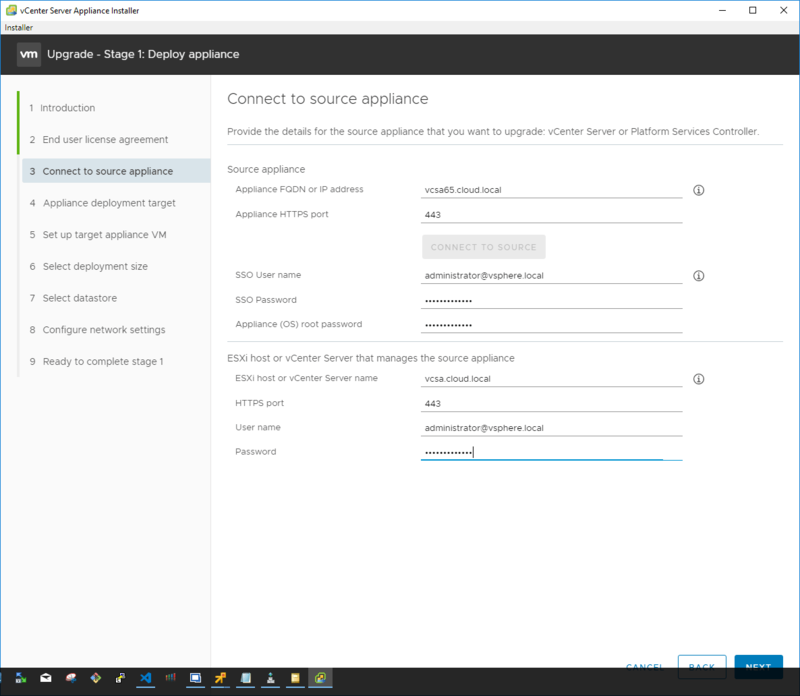 Next, connect to the appliance deployment target by providing the hostname and the credentials. This allows the installer to create the new appliance. Select the folder for the new appliance creation in the target vSphere infrastructure. 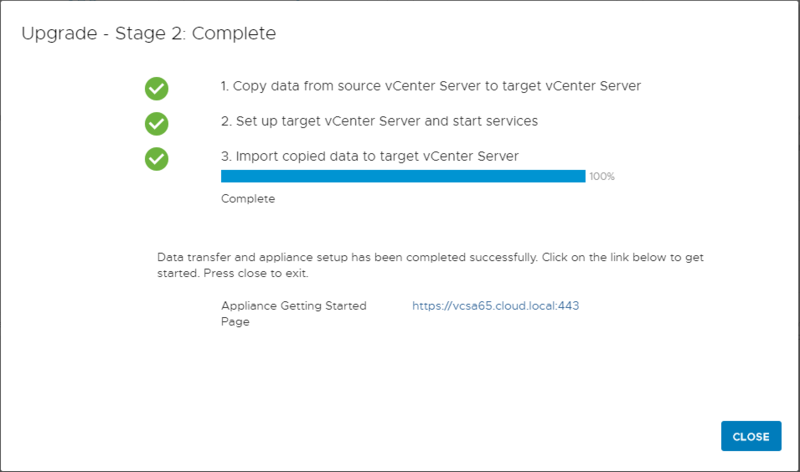 Select the compute resource such as a standalone host or vSphere cluster to house the new vCenter Server Appliance. After configuring the vSphere connection to the target environment, you are asked to set up the target appliance virtual machine by providing a name, root password and confirming the root password. 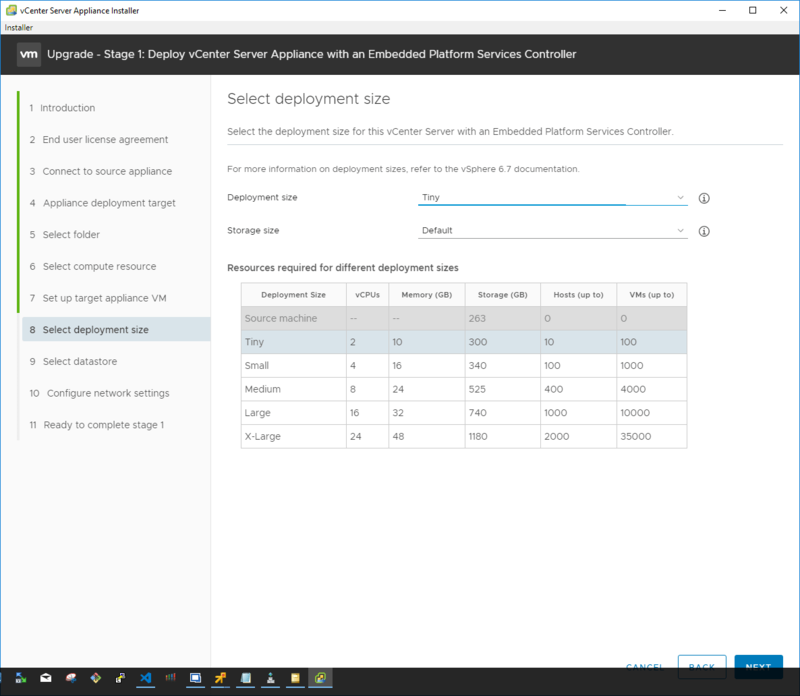 Configure the deployment size for the resulting VCSA appliance. The installer provides great information right on the installer GUI configuration page for the deployment size options. Select the datastore the new VCSA appliance will be housed in. You also have the option to select the Enable Thin Disk Mode which thin provisions the resulting VCSA appliance disks on the datastore. This means that blocks are only zeroed out when they are written to. This saves a tremendous amount of space since space is only claimed on the datastore as the blocks are written to. 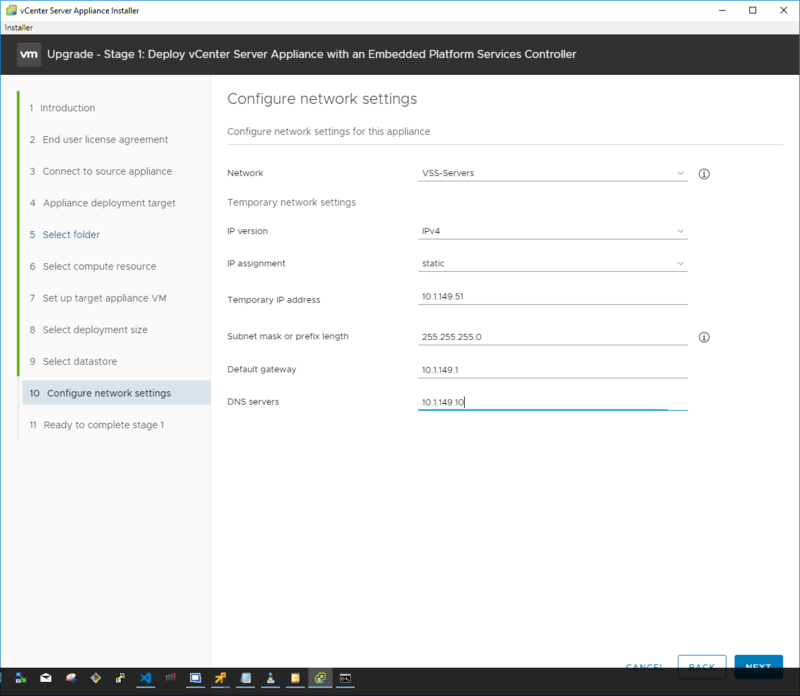 ON the network settings configuration, choose the port group to attach the resulting VCSA appliance to as well as the temporary IP address for the appliance. Keep in mind that ultimately, the installer is going to assume the IP address of the source appliance. So here, we are simply giving it an IP address that will allow it to communicate with the source appliance during the upgrade process to copy data across. 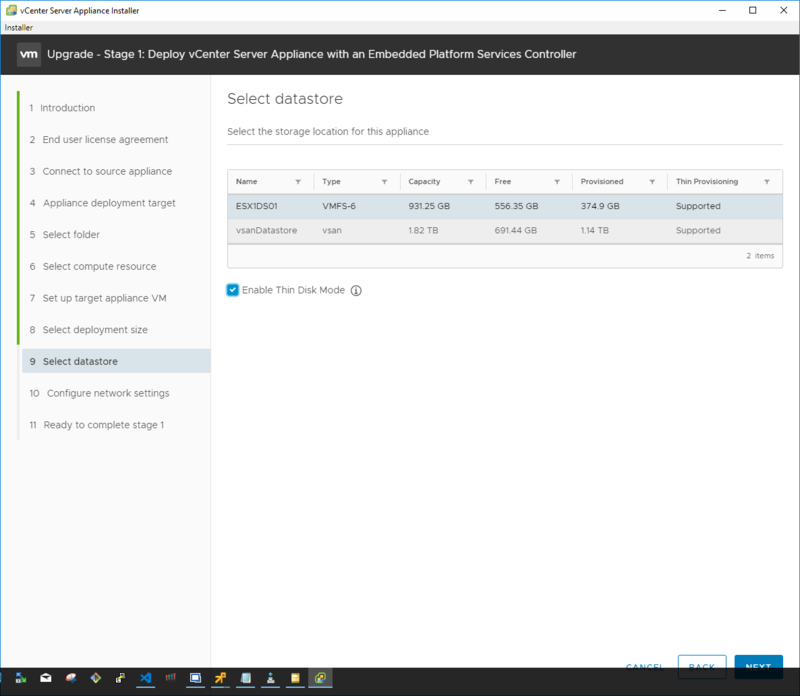 The Stage 1 process is now ready to begin the actual configuration of the VCSA appliance in line with the parameters configured during the wizard. Click Finish. 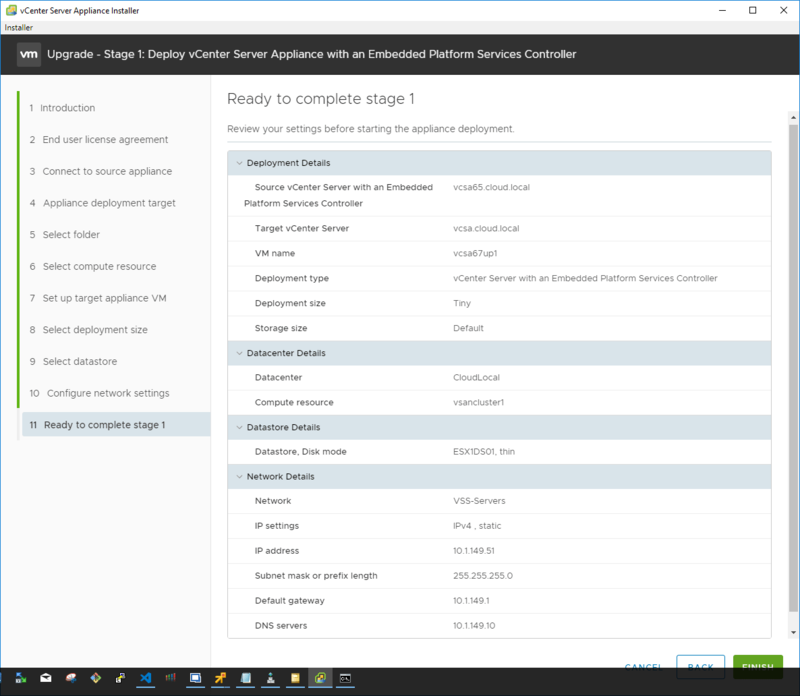 Stage 1 – Deploy vCenter Server Appliance with an Embedded Platform Services Controller begins. 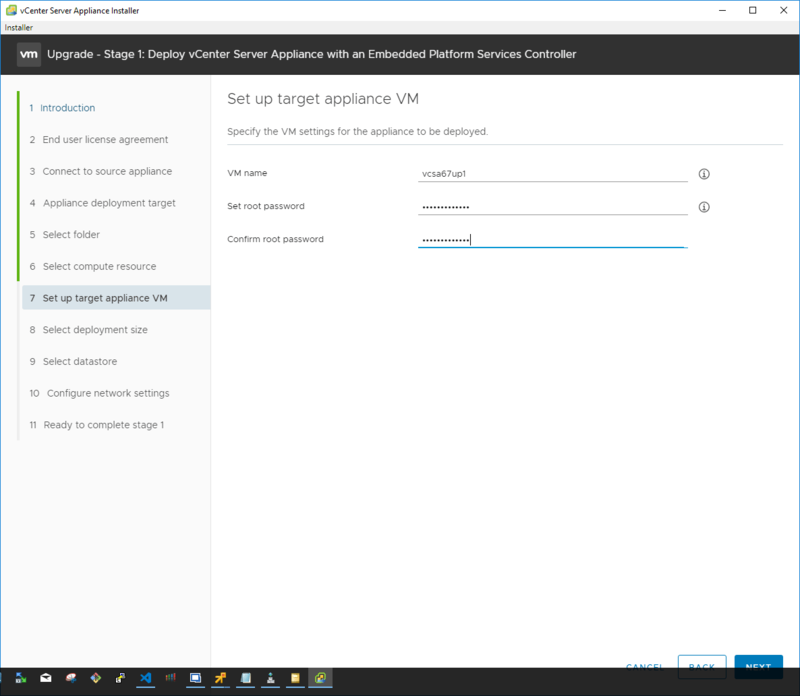 The new appliance VM is deployed into the vSphere inventory. Stage 1 of the deployment finishes. Stage 2 begins. 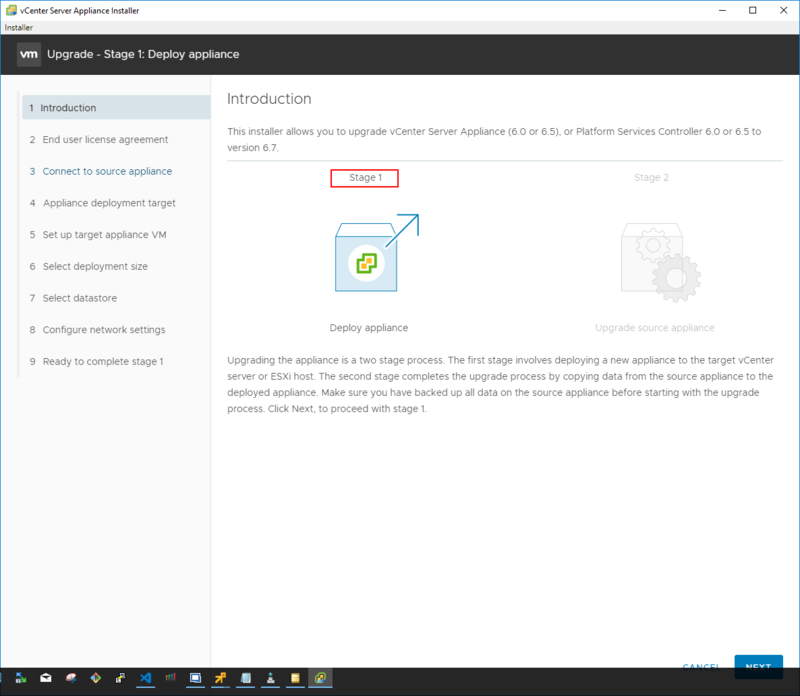 In Stage 2, the installer copies data from the source vCenter Server Appliance to the deployed appliance. In the introduction screen, the process details are displayed. The Pre-upgrade check result will display any warning or other errors that are found. Below, we have warnings about legacy patch baselines, etc. After connecting to the source vCenter Server, the Select Upgrade data screen displays. Here you can choose which data is copied to the new appliance. The various data sizes are displayed for each option. Next, choose whether or not to participate in the CEIP program by checking or unchecking the box. Stage 2 of the upgrade process is ready to begin. The chosen options are displayed on the screen along with the option to either go back or Finish the process. 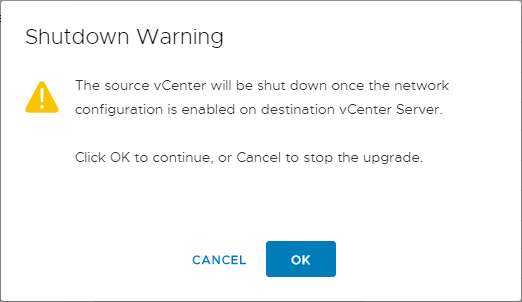 You will see a warning displayed indicating the source VCSA appliance will be shut down during the process. Click OK to continue with the process. The Data transfer and appliance setup begin in the Stage 2 process. After some time, the Stage 2 process will complete. 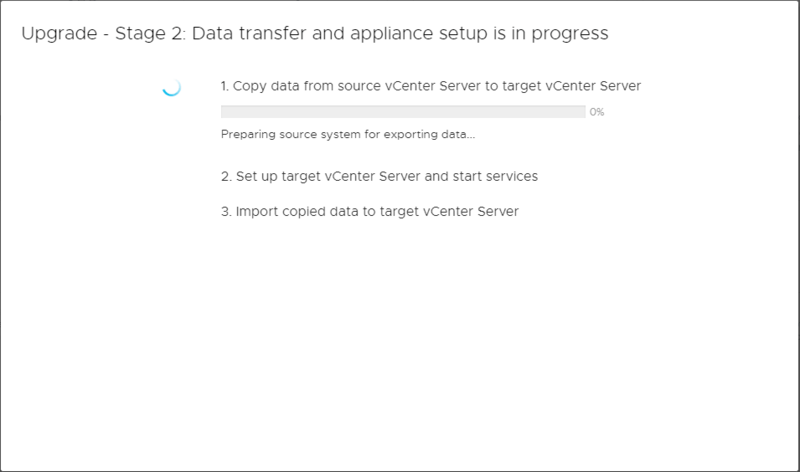 As you can see the three steps as defined are to copy data, set up the target vCenter Server and start processes, and then import copied data to the target vCenter Server. After a successful upgrade process, you will see the link to the appliance displayed on Stage 2 complete screen. 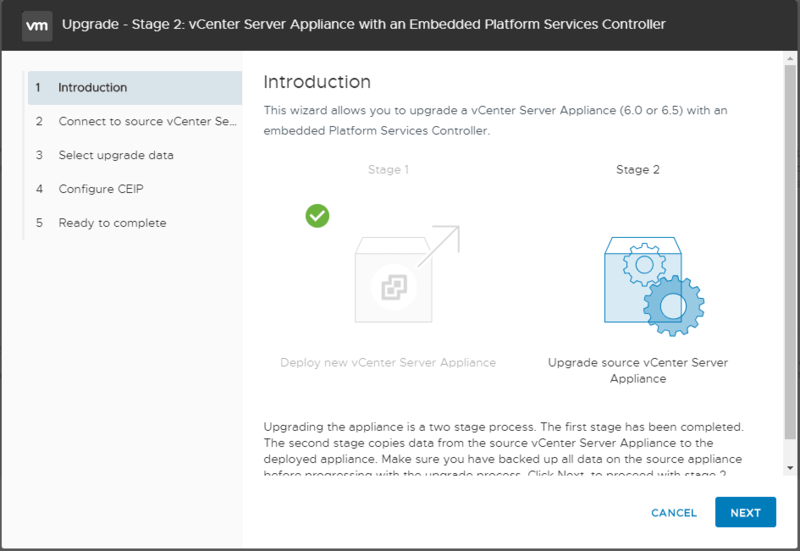 In this walkthrough, we took a look at how to upgrade the VMware vCenter VCSA Appliance to vSphere 6.7 Update 1. With the recently new process using the Upgrade installer, VMware has made the process extremely smooth. 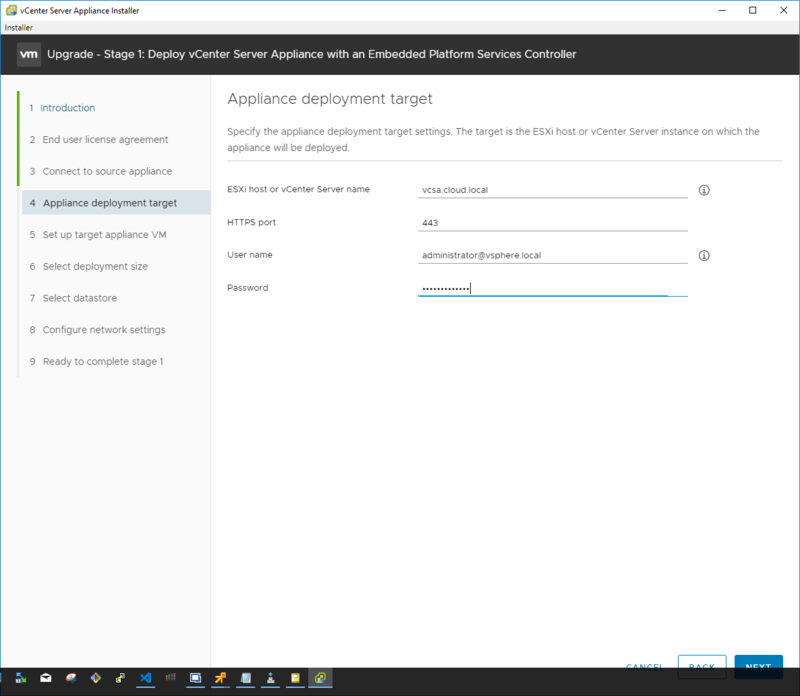 The 2-step process involves deploying a new appliance and then copying data from the legacy VCSA appliance over to the newly deployed appliance. This provides an easy and clean way to move from legacy versions of vSphere up to the new vSphere 6.7 Update 1 release. Keep in mind the order of upgrade operations and always do your homework with VMware products that you have integrated as well as third-party applications such as backup software and their compatibility with the newest vSphere release. Most third-party solutions integrate with vCenter as their point of management in the vSphere solution. The next part of a simple upgrade after upgrading vCenter Server is upgrading the ESXi hosts themselves. 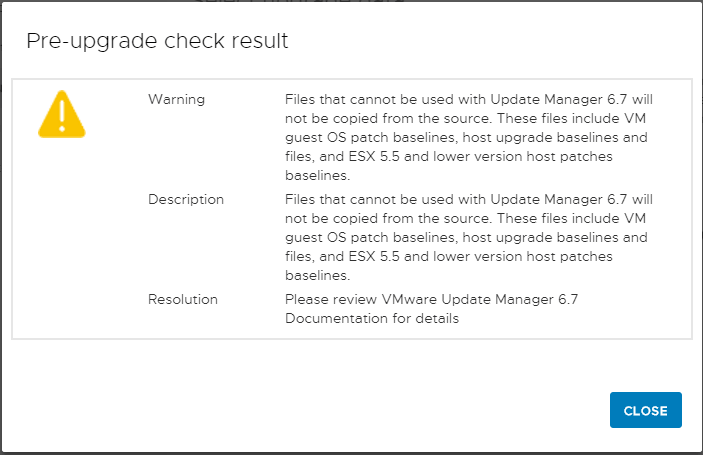 Next, let’s take a look at upgrading VMware ESXi to vSphere 6.7 Update 1.